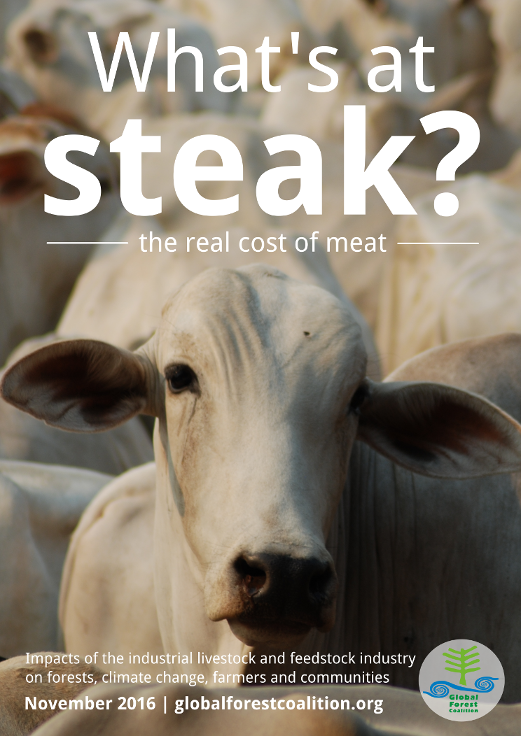 The Global Forest Coalition launched a new report titled “What’s at steak? The real cost of meat” at the meetings of the Convention of Biodiversity in Cancun (CBD COP 13), Mexico. The livestock sector is one of the highest contributors to forest loss, and climate change at 14.5% of the global greenhouse gas emissions, but has received little policy attention so far. The report will highlight that changing the way we produce meat and dairy products, and how much of them we eat, could provide relatively easy to achieve but far-reaching win-win- win impacts—for people, including farmers and women, for forests and biodiversity, for animals and for our climate. This detailed report shows on the ground impacts of industrial livestock production by examining the situation in five countries—Bolivia, Brazil, India, Paraguay, and Russia. It presents concrete recommendations for policy-makers and argues that the industrial livestock production model (‘factory farming’), including Concentrated Animal Feedlot Operations (CAFOs), and large-scale cattle ranching for beef are unsustainable, and a leading cause of deforestation and climate change. The report highlights the scale of industrial livestock operations, and predicted growth in the sector, which governments are currently promoting and supporting with perverse incentives.